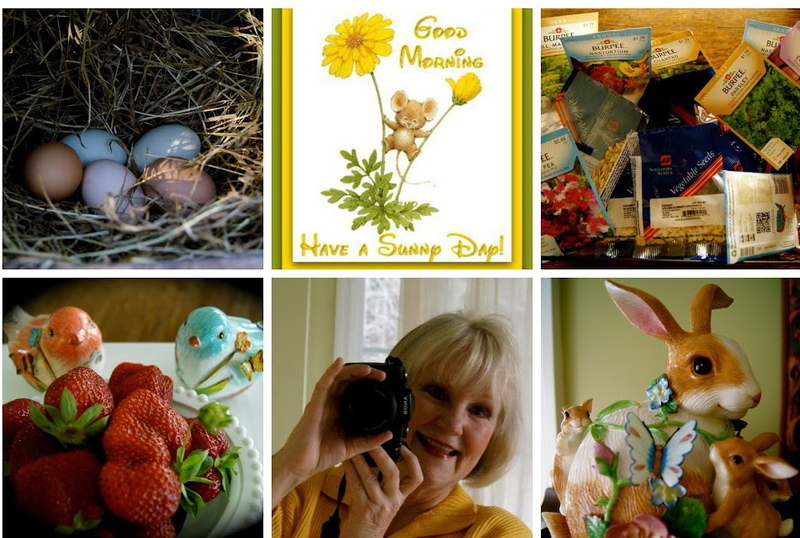 ~To live, love, and journal our days at~ : "Baskets of Love"
Do you know of someone who is either living in an assisted living facility, someone who is facing surgery or other medical procedures, that limit their activities? I have this great idea to make their convalescence time more enjoyable, I call them, "Baskets of Love". I have had the privilege to make and give three this month. I am showing two of them, as I forgot to take a photo of #three, which went to a friend who is now living in an assisted Living facility! Here is the fun part, the recipient can only open "One" gift a day, thus making the anticipation even more fun! 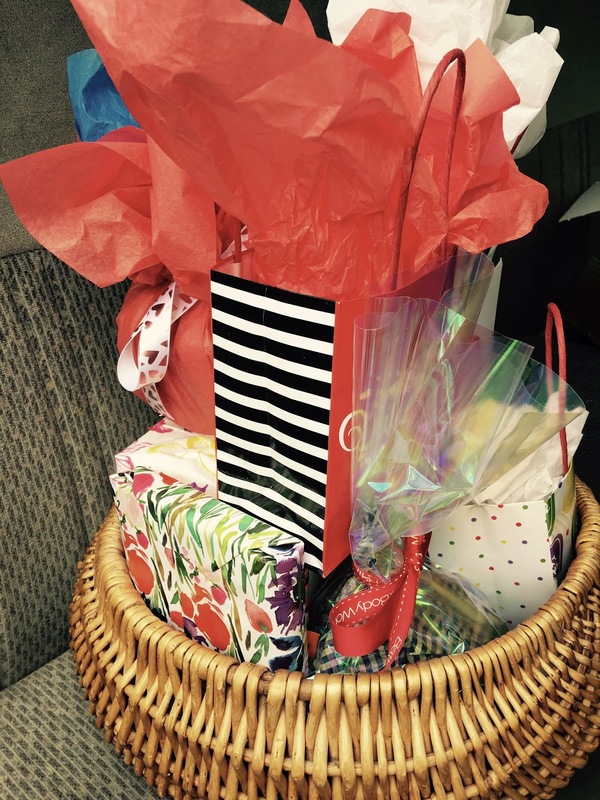 This basket went to someone very dear to my heart too, my sister, who is also recovery from breast surgery! We are giving thanks for a great report! Each day her DH would take a photo of her opening her gift and send it to me! You should have seen the smile on her face, (and mine), I got more enjoyment than she did, and was sad when the last gift had been opened. Here are a few suggested items for the "Love Baskets", A soft fragrant candle, small packs of Kleenex tissues, hand sanitizers, bath and body gel and cream, a journal to record their thoughts, soft fuzzy socks, a lovely mug, a box of tea, preferably their favorite, a devotional book, a note pad with pen, a small box of chocolates, I made cookies and placed then in a mason jar, I also wrapped a jar of jam, a favorite magazine (Life Beautiful). The list is endless, it is amazing how a little bit of money and time can brings so much Joy! I found so many items at the Dollar Tree, The Christmas Tree Shop, TJ Max, Marshals,, on sale at some of my favorite retail stores. Sue, What a blessed thing to do for your friends. I will have to remember this idea. Such thoughtful items that are sure to brighten one's day. Sending you warm hugs today. Thank you for your sweet comment yesterday! I have done those and its so true, I think I got more enjoyment out of them than the person I gave them too. I am glad you wrote about it because its a nice reminder to do it again. I gave some of the same things too. Have a wonderful day Sue and I will be praying for your friend. A very loving thing to do. ♥️ Wonderful ideas. Saying a prayer for your sister and Beverly to have a return to excellent health. What a blessing you are! I love that you got more enjoyment than the beautiful person you gave the basket to...there is so much joy in service!! Thank you for the suggestions, this is something I would love to do. My mother was in a memory care facility for over 6 years, and she loved getting thoughtful gifts from friends! Frances will be in my prayers! Bless you, Sue! A wonderful way to serve one another and to bear one another's burdens. Thanks for sharing these ideas. What a wonderful idea and such a blessing. This is a lovely idea, Sue. Someone did that for me years ago when I was in the hospital and it really was fun opening up the various gifts. I love your ideas for items to include! Sue, what a beautiful and sweet idea! It isn’t very hard to share love...Happy Valentine’s Day! What a wonderful idea! This post made me smile and I can imagine the smiles on the faces of those ladies:) Thanks for sharing this idea, my Sister-in-law is recovering from breast cancer surgery and could use a smile in a basket! Have a blessed day dear friend, HUGS! Praying for ALL! What a beautiful, thoughtful idea! I'm sure you bring such joy to those who are going through such a difficult time. If you can bring a smile to their face or simply distract them from their worries for even a minute, then it's absolutely worth it all! You have such an amazing, giving heart! I'm a new follower here! Oh Sue, what a precious and beautiful thing to do for others. I simply love this idea. You have a heart of gold, my friend. Thank you for the incredibly sweet comment on my blog this morning. It's always a joy to hear from you. Have a blessed day! Hugs! Sue, what a wonderful thing to bless their dear hearts! I love the idea of opening a gift a day...how fun! Prayers for your friend and your sister as one of my own dear sisters has recently gone through it as well. I agree, it blesses the giver just as much or even more. Hugs! Beautiful baskets with such inspiration for us. Thank you! 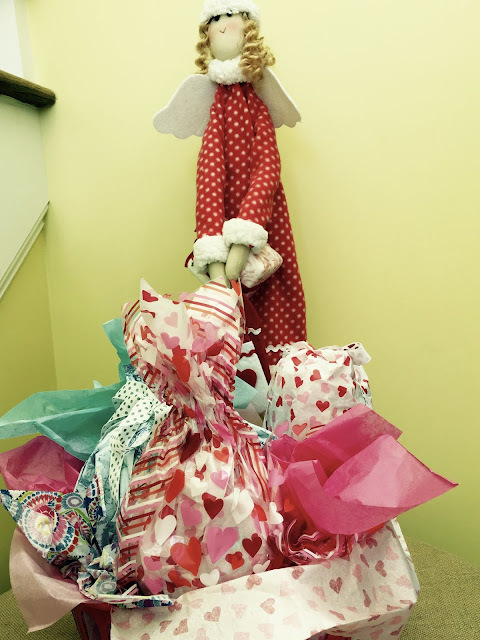 That angel doll is adorable!! I love this! Our church has been collecting these types of things for baskets for people in the hospital, but I think I should start looking for things like this to give on my own. I'm sure they really do bless those who receive them. OH my goodness Sue, what a special treat for your friends. You are such a sweetheart, I know they loved feeling so special! Great post.